The Supervap is a large industrial machine with a unique boiler supplying 13.2 litres of dry saturated steam per hour at up to 10 Bar of pressure. This a ‘state of the art’ industrial steam cleaner that has all the power and features expected of a large 3Ø machine. 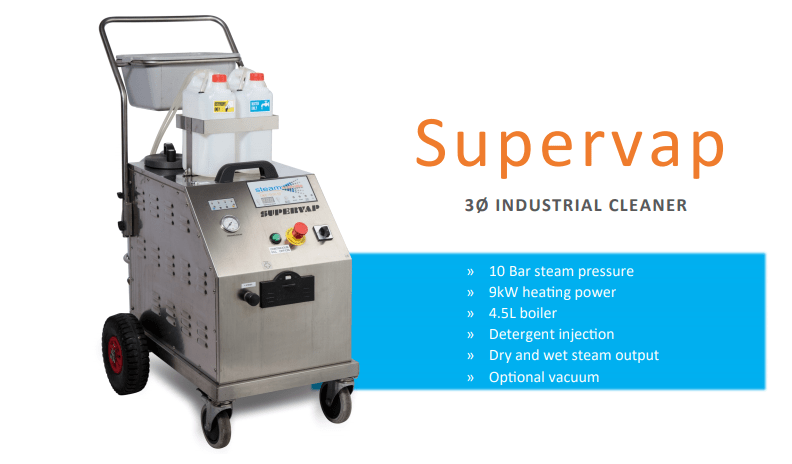 The Supervap is a mobile cleaning and sanitizing solution capable of delivering wet or dry vapor steam on demand in both static and continuous applications. The Supervap has a unique 4 level electronic regulator to give you quality wet steam or detergent injection for even quicker and more efficient cleaning when dry steam isn’t enough.